The water we drink has the largest impact on our health. 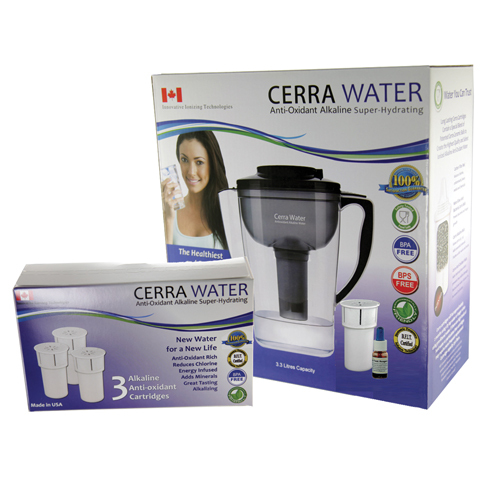 Cerra Water transforms regular water into truly extraordinary water through an advanced multi step process. 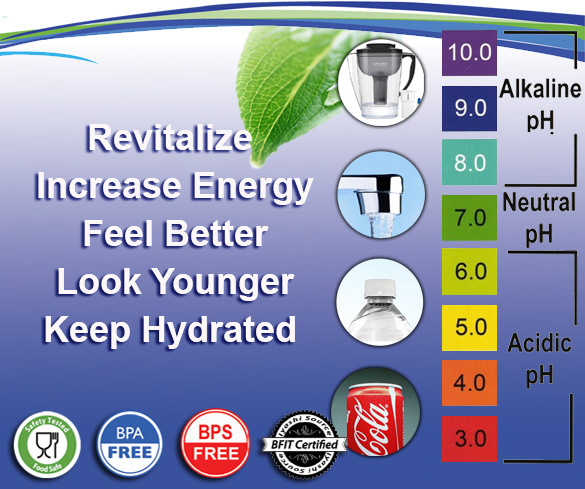 Cerra Water alkaline anti-oxidant water provides many benefits far beyond regular filtered water. Our bodies are naturally alkaline and Cerra Water balances the alkalinity buffering the acidity we encounter from food, drinks, pollution, stress etc. Cerra Water is 1000x more alkaline then tap water! Cerra water is filled with anti-oxidants which eliminate free radicals. Free radicals cause oxidation in our body breaking down our cells. Cerra Water’s anti-oxidants stop these free radicals from causing damage and improves cellular functions. Cerra waters transformative process breaks up large clusters of water molecules into smaller clusters which are easier for your cells to absorb. This lets you absorb the water you drink rather than having it pass right through you. Our bodies accumulate various toxins (acidic waste) from pesticides, chemicals, pharmaceuticals and other impurities found in our food, water and air. These toxins are flushed out of your system when drinking Cerra Water. Cerra Water helps strengthen your immune system through the added anti-oxidants and vital nutrients it infuses in the water such as magnesium, potassium, zinc and calcium. Cerra Water is a natural solution for keeping a strong immune system. When we eat too much acidic or junk food, our bodies convert the acidic waste into fat cells. By drinking Cerra Water we neutralize this acidic waste flushing it out rather than contributing to unwanted weight gain. 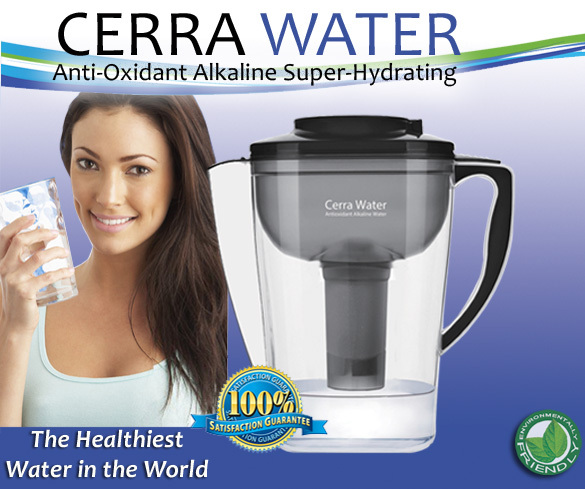 Cerra Water creates alkaline anti-oxidant water in a natural way rather than artificially using electricity. The ceramic balls found in Cerra filter mimic how water flows down a mountain stream picking up alkaline minerals. Cerra Water uses the highest quality materials in the pitcher and filter. The Cerra Pitcher is one of the only water pitchers that is made of certified Food Safe plastic with German TUV certification. With Cerra Water you can be assured that safe plastics are used, that are BPS/BPS free and don’t leach chemicals into your water. Reduce chlorine, contaminants, heavy metals and chemicals. Improves the body detoxification, eliminating toxins. Easily absorbable for improved hydration. Step 6. Energized - B.F.I.T. Receive free shipping on all order with a minimum purchase of $150. Sign up for our Newsletter and receive instant discount coupons for your order. What Are People Saying About Cerra Water®? 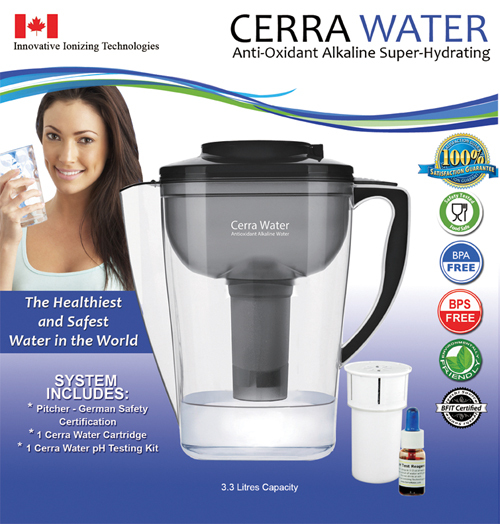 "This is to certify that I am thrilled with my new and highly-effective Cerra Water pitcher. Here’s why. It’s as easy as running the water into it, and as quick as a minute for the filter to do its work. I not only love the taste of the water, but have also noticed more energy than ever before. As my over-seventy husband and I were already leading a healthy life-style, we were most surprised by how much more energy we got within days of drinking the Cerra water. This water is the best anti-aging factor I can possibly imagine. We both get compliments on our newly moist skin. We are more mentally alert than ever, and less forgetful. We focus on a lost fat and stabilized our weight, yet still manage the daily glass of wine and 2 ribs of chocolate! As a European I especially appreciate the reliable German (and other) certification for quality and, above all, safety, as I’ve learned to beware of cheap imitations. The more “alive” and beneficial your water is, the more alive you will be. "When I changed from drinking water from an expensive electric ionizer to the Cerra Water Pitcher I was impressed with an improvement in energy, regularity and clarity of thought. Because of my high blood pressure I had more peace of mind using the Cerra Water knowing that I was getting a balance of minerals rather than a high amount of sodium from my electrical unit. My Cerra Water pitcher consistently produces a PH of 9.5 and an ORP of around -400. I love being able to take our pitcher with us wherever we go out . and drink fresh alkaline water. "Cerra Water comes out of the jug as a light tasting water and the best water I have ever tasted. The light taste gives me the assurance of a properly filtered water and that is absorbed easier by the body. This water is full of essential alkaline minerals with the highest ph level you can get without electrolysis process. I don't know how is works through my whole body but since I regularly drink the Cerra Water a lot of my body pains (joints and in the fingers) are gone and I can eat as many nuts as I want without the fear of pain on my body. "If it were possible to supplement you way to heath I would have been perfect by now. After spending a fortune on supplements over the years my friend. Mary, suggested that I get back to basics and look at the water that I am drinking. I did a ton of research and found the Cerra water on the website. For less than $200 this ii the best investment I have ever made. Not only has my skin cleared up but my IBS which has plagued me for years is about 80% better. I can finally enjoy eating without being scared of gut pain. "I am 98% PAIN FREE for the first time in I don't know how many years. I walked around yesterday feeling better than I have in such a long time. I am "gobsmacked" with this Cerra water. ....While I was taking notes yesterday I kept writing down people/ businesses/ professionals that I thought would be keen on this water....does that mean I'm further hooked?!! "Since I started drinking water from our Cerra Water jug I no longer have pain or the on my hands and fingers. I also experience less symptoms of hyper acidity in my stomach so I don't take my regular anti-acid medicine anymore.. Cerra Water is the secret my good health and I am so glad I discovered something as simple s drinking water to help me get rid of pain. Thank you Cerra Water. "My energy levels have definitely gone up since drinking the Cerra Water - way beyond what I would have thought possible - with the result that I'm able to do the regular exercise that I'd been wanting to do for years. This Cerra Water has kick-started a upward cycle of health. Drinking this water is one of the easiest things I have every done towards getting fit. "I have cystic acne for years now and have tried everything to clear it up to no avail. Once I started drinking the Cerra Water and clearing the toxins from my body my skin began to clear up. Thank you Cerra Water. "I never realized how dehydrated I was until I started drinking this Cerra alkaline anti-oxidant water. I became a water addict over night.. the water tasted so sweet and my body craved it. Although I had been drinking water before I was not absorbing it. I noticed am immediate increase of energy and vitality. My skin took a glow and everyone said I looked 10 years younger. "I have had athletes foot and since drinking the Cerra water I don't need to put medicine on my feet anymore. I guess now that my body is alkaline its been clearing up my feet. "I was so frustrated with my yo- yo weight gain despite marathon running and watching my diet. My closet was full of small, medium and large cloths. Since drinking the alkaline anti-oxidant water I only have size "small" in my closet. 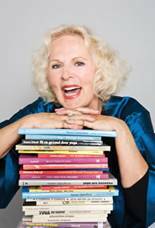 There is such peaceful happiness that has come about with getting my body into balance. Yes.. I look and feel a lot younger. "I have been a Cerra Water distributor since December, 2010. To Each of my customers has been 100% satisfied with the quality and functioning of the products and many have gone on to purchase more pitchers for friends and family. David Raphael - CEO, Awakening Mind Inc."
"I paid $4000 for an electrical ionizer. My daughter would never drink the electrical ionized water because she didn't like the taste. Could it have been the chemicals that their electrolysis enhancers that the electrical ionizer put into the water that she was reacting to? She loves the Cerra water taste and is finally drinking water. Since drinking the Cerra water she has noticed an overall improvement in her well being. I really like the convenience of the pitcher for traveling and it safety. Who would have guessed that a water pitcher has more safety certifications for clean water than any other water company out there. 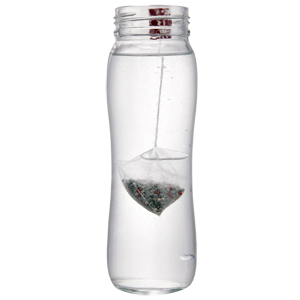 The plastic is BPA free and the German certification has guaranteed that that is absolutely no leaching. The electrical ionizer are all plastic and yet there is no BPA free for their water tank or hoses! I love Cerra water! It tastes like water from a mountain stream.